In iOS 5, they only search glyph for missing code at fallback.ttf . However, they changed in iOS 6. In iOS 6, they search the whole font list. In Xcode , add MON3 Anonta 1 in info.plist (UIAppFonts). 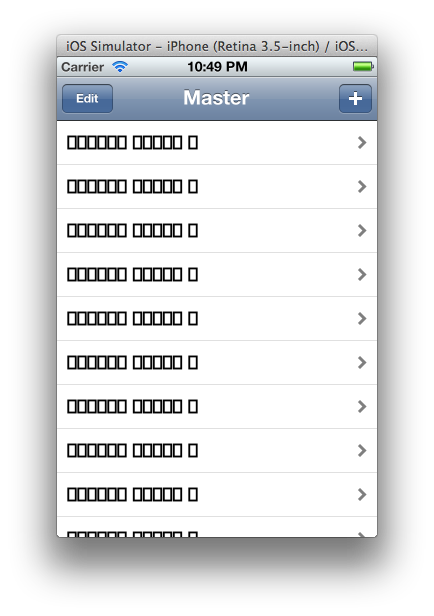 Just used UITableViewController and add around 20 rows. 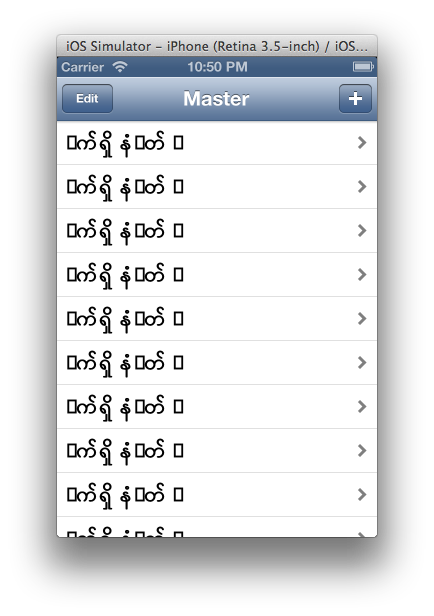 We are using Myanmar Unicode and run on iOS 5 simulator. It didn’t show font and we can scroll smoothly. Some of the glyph are appear without declaration of the font. It can’t show well yet. But it’s a problem of not working well with some users like me. I can’t use facebook , email because I have a lot Myanmar friends and they are using and sending email with Myanmar Fonts. iOS didn’t support Myanmar Fonts but they are trying to find in all fonts. So, UITableView glitches on fast scrolling. I hope, Apples will use iOS 5 font fallback problem for us. Myanmar , Khmer and some country didn’t use well with iOS 6 because this fall back system. Yes, it may be good for feature. Apple can support new font easily in futture and no need to put on fallback.ttf. Just add new fonts if they want to support. It easy like that in future. Yes, it is bad for me. If apple didn’t support some language like Myanmar , Khmer , it trouble a lot in all of the apps like facebook , email , twitter ,etc.